یکی از راهبردهای اصلی نظامهای آموزشی در جهت بهبود کیفیت تدریس، افزایش مهارتهای اقدام‌پژوهی آموزشگران بوده است. 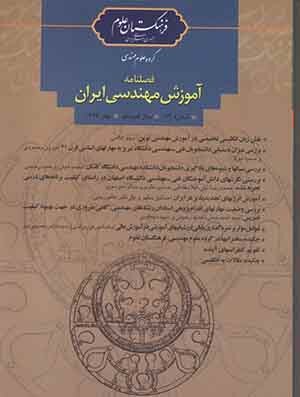 هدف تحقیق حاضر بررسی وضعیت مهارتهای اقدام‌‌پژوهی استادان رشته‌های مهندسی بود. جامعة آماری تحقیق تمام اعضای هیئت‌علمی رشته‌های مهندسی دانشگاه کاشان (113 نفر) بودند که تعداد 88 نفر از آنها از طریق فرمول کوکران به‌عنوان نمونه تحقیق مورد‌بررسی قرار گرفتند. ابزار گردآوری داده‌ها پرسش‌نامه محقق‌ساخته‌ اقدام‌پژوهی بود که مهارتهای اقدام‌پژوهی استادان را در چهار مؤلفه (تشخیص موضوع، نگرش به اقدام‌پژوهی، مهارتهای گردآوری اطلاعات و اقدامات پژوهشی عملی) می‌سنجید. روایی پرسش‌نامه به‌صورت محتوایی مورد‌تأیید کارشناسان قرار گرفت. پایایی پرسش‌نامه از طریق ضریب آلفای کرونباخ 85/0 محاسبه شد. یافته‌ها نشان داد میانگین نمرة مهارتهای اقدام‌پژوهی استادان (4/123) بالاتر از نمره ملاک (108) بود. مهارتهای تشخیص موضوع استادان و نگرش به اقدام‌پژوهی استادان، بالاتر از نمره ملاک، مهارت گردآوری اطلاعات استادان در حد متوسط و مهارت اقدامات عملی در رابطه با پژوهش استادان پایین‌تر از حد متوسط بود. 1Assistant Professor, Human Science Faculty, Kashan University, Kashan, Iran. The main purpose of the current study is to identify Iranian higher education faculties’ action research skills. The study population was all Engineering faculty members in the University of Kashan (113 members). A random sample of 88 of these faculty members was recruited for this study. The instrument used in the present paper was a researcher-made action research questionnaire. The questionnaire assesses the faculties’ action research skills in four major catigories (recognition of problems, attitude towards action research, data collection skills, and practical research actions). The overall reliability of the questionnaire using Cronbach's alpha was 0.852, which showed the high reliability and internal consistency of the research instrument. This study clearly revealed that a considerable portion of faculty members are totally unaware of action research as one of the strategies for impoving the quality of education. Further analysis showed no major differences in the educational behavior of faculty memebrs who were either aware or unaware of the concept of action research. The most instresting finding of the current research is that all faculty members recognize educational problems or topics very well (recognition of problems) and are always involved and obsessed with educational issues (attitude towards action research) but are not skillful enough to deal with problems and practical decision-making (data collection skills and practical research actions).